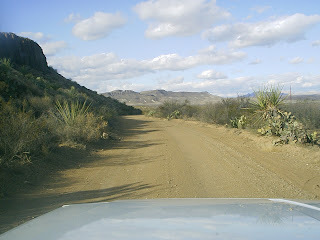 I was glad to be off the road, and on the ranch. Although it was still daylight and would be for a few more hours, I was too tired from the trip to set up camp, so I got one of the rooms at the lodge for the night. After unloading some stuff, I went for a drive around the near perimeter of the headquarters, visited the rifle range and fired a box or so of .45 Long Colt from my Ruger single-action revolver, then went beyond the range a mile or so until the road started climbing. I actually climbed about halfway up the hill in my Cherokee, but the road was gumbo mud from the earlier rainstorm, and I chickened out when I imagined sliding off the edge. So I backed down gingerly, got out and climbed the hill on foot. It was a beautiful view from up there, but it was getting pretty close to sundown so I snapped a few photos and headed back to headquarters for a good meal and some shut-eye. Next morning, I got up at the crack of noon (just kidding! It wasn't that late), ate breakfast and drank coffee, then wandered on foot down to the office. There were a couple of landowners already there, so I drank more coffee while socializing. There is a room at the office with topo maps nearly floor to ceiling on three walls denoting all the areas of the ranch, and with all tracts marked. The 4th wall has bulletin boards covered with memos about tracts for sale and other things of interest to current and potential landowners. In the center of the room is a long table so you can sit, drink coffee, shoot the breeze, and peruse maps and such. Topo maps are for sale in a rack on a table against the fourth wall, and there is also a computer on that table. Loaded on the computer is an up-to-date, searchable database of all the tracts and their owners; so if for example you bought some land from this particular land company, liked dealing with them and wanted to see exactly what else they had available as of today, you could search under those parameters, write down the tract numbers that looked promising and find them on the maps. That's exactly what lots of people were doing, myself included. By this time I had decided that I definitely wanted to buy a second tract; a smaller one, closer to the main road for easy access. main camp, perhaps camp there on occasion but the main camp needed to be more sheltered and easier to get in and out of. for sale, then head out to find them. That's not all I did, of course: I was there to have a good time and decompress from what is euphemistically referred to as the "real world"; so I spent lots of time just going to interesting areas, getting out and exploring on foot. I even explored a few canyons; something I definitely wouldn't want to do during the summer due to the proliferation of rattlesnakes, killer bees and other such nasties. 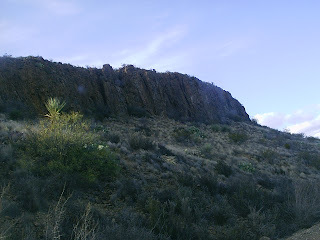 As it was, I kept an eye peeled for mountain lions and bears. I know bears are supposed to be in hibernation during the winter, but it wasn't very cold and I'm not sure if they really hibernate when it isn't cold. During these outings, when my stomach let me know it was lunchtime I would dig a can of something out of my food box, heat it on my old Optimus 8R Hiker stove and eat lunch wherever I happened to be, then continue exploring. That way I could stay out there all day. Besides, there's just something about eating in some lonely canyon far into the outback that really improves the flavor of Beanie-Weenies and saltines. Even back at camp, most of my meals were canned goods and a few perishables, including a large chunk of leftover Christmas ham, that I kept in a cooler. I only ate one restaurant meal during my entire stay on the ranch, and that was at the ranch restaurant. I heard lots of good things about a particular restaurant in Study Butte, but never got around to checking it out this trip. 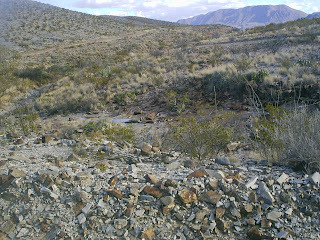 I did go to Study Butte once, and on to Lajitas, where I stood on the bank of the Rio Grande and looked across at Paso Lajitas. I enjoyed the visit and will probably spend more time there next trip, but I spent most of this trip getting to know the ranch. Didn't see all of it either, not by a long shot. I ended up camping in the primitive-camping area at the edge of the HQ compound. It was out of the way, yet very close to the bathhouse, office, restaurant etc. It was also very cheap. I won't say how cheap, because landowners get a break in the price, but suffice to say that even a cheapskate like me didn't mind at all paying for several nights. Let me put it another way: had I camped on my tract, the gas expenditure would have exceeded what I paid in camping fees. Of course, I did visit my tract a couple more times, but most days I didn't drive all the way to that corner of the ranch. as they poked around my campsite, occasionally bumping my tent in their search for food. For the most part the weather was very mild. It was early January, but the temperature reached the 50s most days, even occasionally climbing into the 60s. Nights, however, were cold; and I was glad I had brought a 0 degree mummy bag. Not that it got that cold, but it did drop well below freezing. The woodstove made for comfortable evenings, but once I let the fire die down at bedtime, it would get almost as cold inside as out. Tent canvas just doesn't insulate very well. 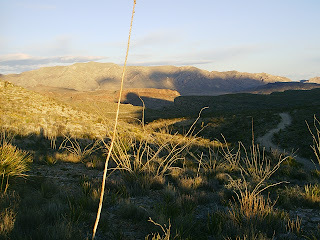 I was looking into Terlingua for a get away location, routine camping/hunting area. Land seems to be cheap and certainly isolated. Was curious if you still had your tracts down there, went often, and generally what your impression is now that it has been 6 years since your first visit. I do still own my land there, but unfortunately don't get out there very often and when I do, I am usually on a schedule and do not have time for more than a quick peek. My impression of the area hasn't changed, though. You have to be tough and have a desert rat mentality to live there.